It seems everywhere you look there are new orchestral sample libraries and instruments being introduced. The sheer abundance of choices can be overwhelming. IK Multimedia with their introduction of Miroslav Philharmonik 2 has made this task a little bit easier. Many of us familiar with the early days of sampling remember the excitement that surrounded the original Miroslav Vitous Symphonic Orchestra library. These were ground breaking in the sense that they were among the first attempts to provide composers with samples of a real performing orchestra that captured the emotion and characteristic sound of world class musicians. These original libraries produced in 1993 and were delivered on data CD. 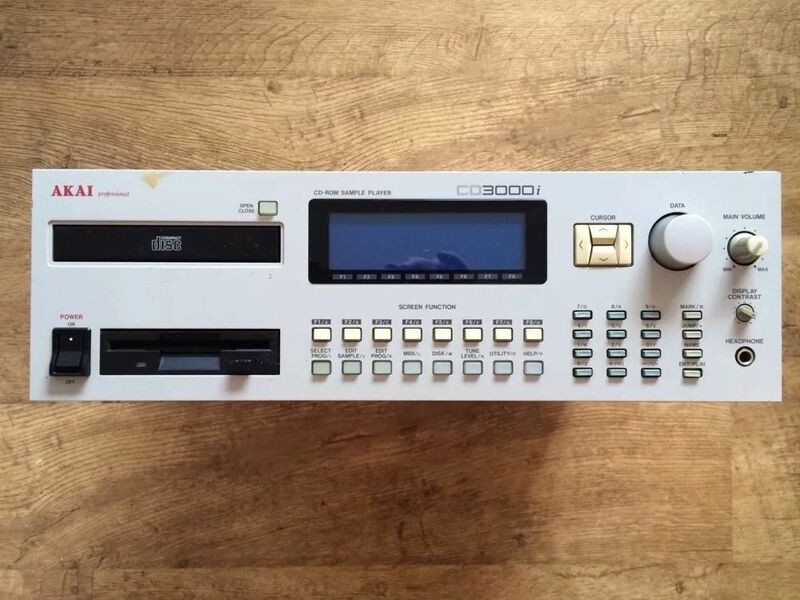 You had to consider the limited amount of RAM (around 4mb) that was available in the early Akai hardware samplers. Remember that when the original library was introduced the VSTs and Virtual Instruments we have today were just a musicians Sci Fi dream. The other issue was the price. Now hold on to your seat as the original libraries on 5 CDs sold for over $4000.00 (1), just think about that for a moment. Well thankfully we are enjoying an amazing time in the life of the music software industry. 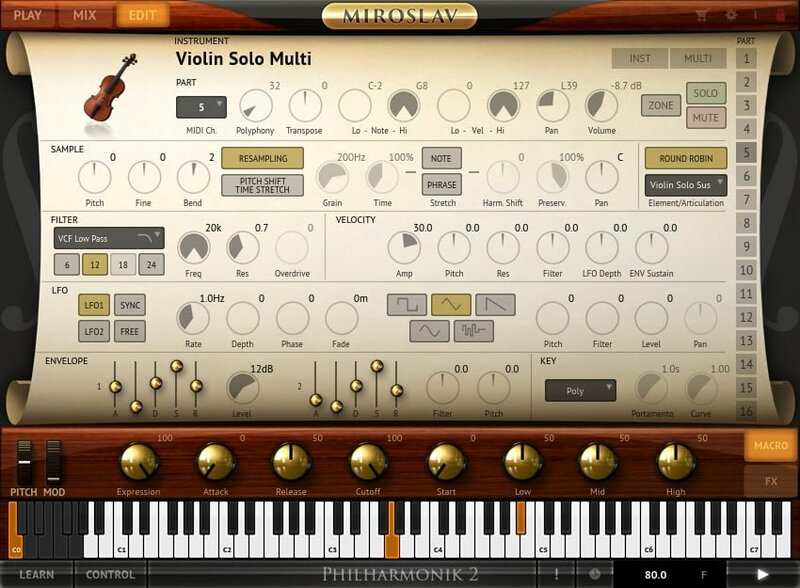 Multicore computing power paired with the low cost of RAM and Hard Drive storage has allowed developers to bring us some of the most expressive virtual instruments to date and Miroslav Philharmonik 2 is no exception. So now imagine today we now have these wonderfully emotional and powerful samples without the limitations of days gone by and to make things even better you can actually afford it at less than one tenth the original price. So let’s take a look at this amazing new instrument collection. First off instead of only having approximately the 3.5 gigs contained on the 5 original data CDs, Philharmonic 2 supplies you with over 58 GB of sample material. You need to make sure and allow for plenty of time to download and extract all of the installation files. With the shear size of this instrument IK Multimedia has the option of purchasing the installation files on a USB Flash drive which is becoming a more popular distribution medium for companies selling muti gigabyte sample libraries. 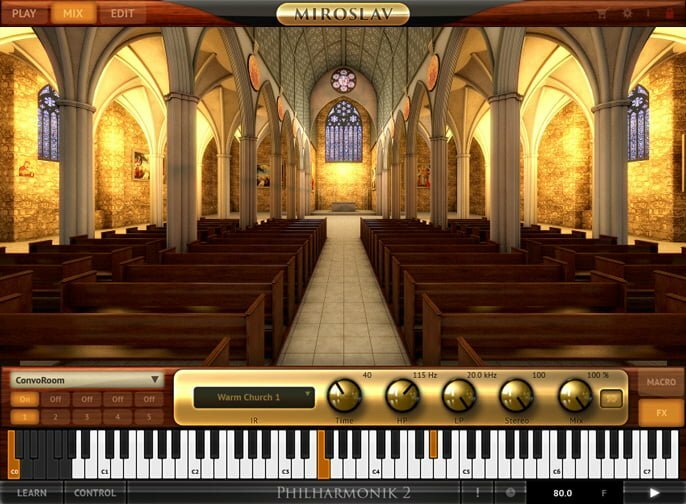 Philharmonic 2 works in stand alone as well as provided in the popular 64 bit only plugin formats. Philharmonik 2 presents its own take on the SampleTank 3 look and feel. It seems to reflect a handcrafted, old world style, staying in touch with the feeling of working with a classical orchestra. 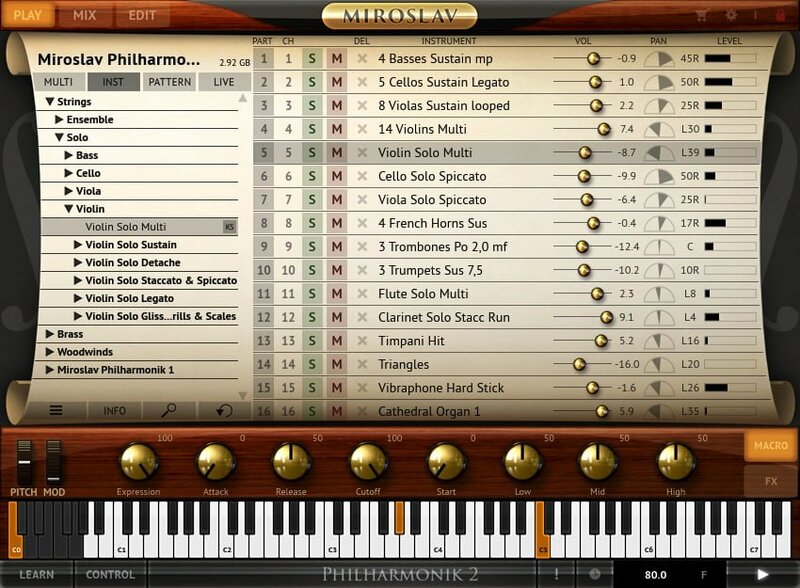 Since this is built on the SampleTank 3 engine you can use the Philharmonik 2 library in conjunction with SampleTank 3. This gives you the option to load only one instance of SampleTank 3 into your project or performance enviroment. Here is a snapshot of the sound library included in Philharmonik 2. You get some brand new recordings of these great instruments along with the original samples that were a part of the first version of Miroslav Philharmonik. In order to capture the character that sets Miroslav Philharmonik 2 apart from other libraries they went back to where it all began with the Czech National Symphony Orchestra (2). This orchestra and their associated recording facilities have provided the soundtracks for many major motion picture and studio projects. They have a great reputation for providing quality and powerful performances that draw from world class musicianship and the latest recording technology. This is taking a look at Studio – 1 which they call the Gallery. You can see there is ample room to seat a complete orchestra and capture each instrument in context and position. Recording the samples in this way allows the sound to exist just as it would be heard in a live performance. Having everyone in the same space adds that magical ingredient when players are interacting with other players. This is one of the characteristics that sets Miroslav Philharmonik apart from other sound libraries and virtual instruments. You feel that emotion and personality coming through. If you look at the image above of the studio just picture yourself standing at the conductor’s position. 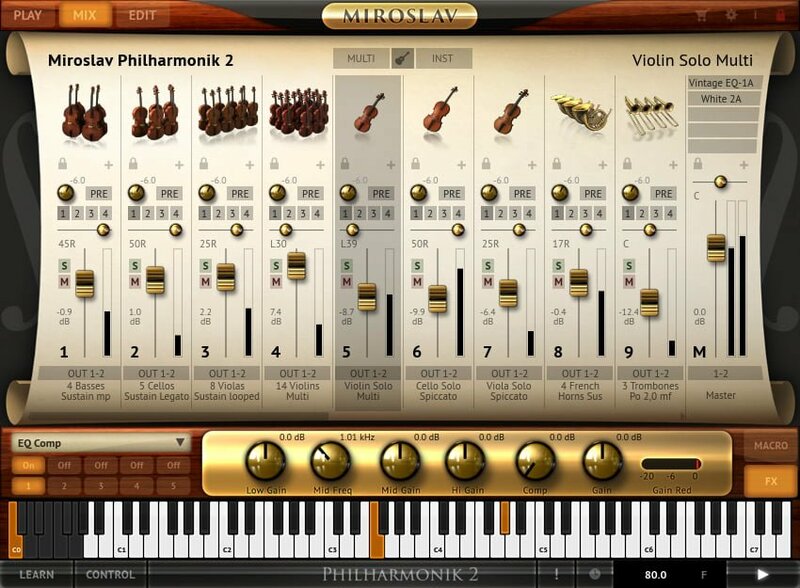 Miroslav Philharmonik 2 gives you the tools you need to step up and take control of these powerful sounds and performances. Let’s take a look at some of the different editing modes provided. Here is where you will spend most of your time working wth Philharmonik 2. You have 16 parts or slots to place your instruments. These can correspond to related tracks in your DAW of choice giving you control over each instrument part. The left side is the sound preset browser. Here you have all of the general instrument groups organized to assist you in finding the particular instrument you are looking for. They are grouped in levels starting with larger sections all the way down to solo and single instruments. The center section is more of an overview where you see all of the corresponding part, channel, solo, mute, volume, pan and level indicators. Below the main section you have a virtual keyboard that provides you with indicators of notes being played as well as being active in itself to trigger notes and initiate keyswitches for variations in the articulation programmed in some of the preset instruments. Above the virtual keyboard you have what IK calls Macro Controls. These are quick shortcuts allowing you to adjust various performance parameters and settings. These would cover things like Attack, Release, Filter Cutoffs, as well as some basic EQ and effects settings. Pictured here you have a virtual mix console of sorts. This would be something similar to what you would have in your more fully featured DAW. On this screen you have a little deeper control over the general mix and sound of the instruments you have loaded. It’s amazing how much control you have over the signal flow here. You have four different effects sends as well as five slots where you can place different effects on each individual channel. IK Multimedia have really been generous in also including many of their top effects plugins that have been derived from their best selling mixing effects and mastering library. Who says you need to follow convention? With Philharmonik 2 you are given the freedom to explore the outer reaches of changing the preset sounds into ways that would not have been imagined previously. In these days of modern composition you are always looking to get to the edge of the unconventional or unusual to tap into just the right atmosphere or inspiration that will fit into the project you are working with. IK Multimedia have given you some amazing synthesis tools to allow you to shape and manipulate the beautiful samples into something possibly more beautiful and possibly just the opposite it’s your call. Some of these tools include advanced time and pitch stretching as well as resampling to get you to your destination. With this latest version of Philharmonik IK Multimedia has introduced what they are calling the ConvoRoom. 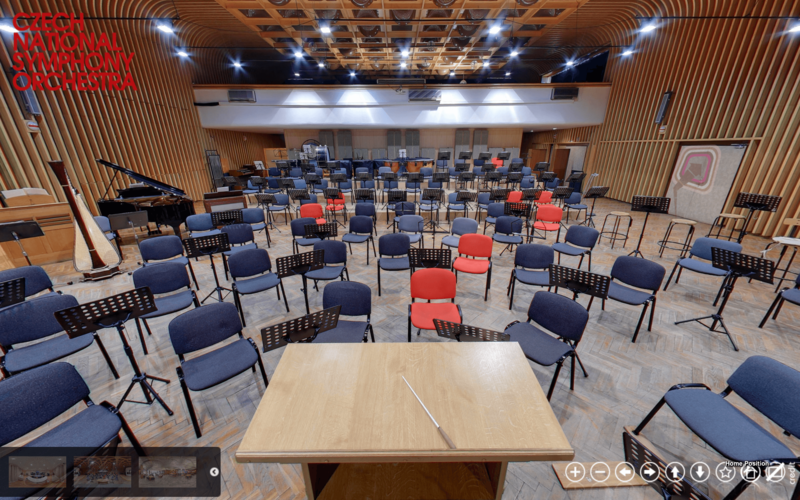 What you have here is sort of like a virtual snapshots of real spaces where you can place your instruments and they will sound as if they are in that very room acoustically. So you could put your orchestra in the largest cathedral or in a small living room. As you can see from the image above Philharmonik 2 gives you a visual representation of the space that is being emulated. Seeing this image provides visual cues you can use in your realization of your soundstage. You have some control over the EQ of the room, the actual reverb time as well as overall control of the stereo image and how much of the room effect to apply. You are given several real spaces to use along with the ConvoRoom effect. Well when you get down to it no matter how beautiful the user interface is if the samples sound bad then you are sunk. Fortunately for us the samples really are wonderful and one of a kind. IK working along with Miroslav Vitous have taken the combined years of experience and have presented us with a beautiful collection of sounds. You are given so many different ways to put your particular virtual orchestra together. You can have a large string section or opt for a more conservative smaller grouping. What they also have provided in this library are some excellent solo instruments. the power of these comes when you can combine them with the larger sections to add a spark of personality and life. Some other cool things provided are some new articulation recordings where you have the strings doing runs and moves that are actual samples of how the real life player would do them. this ensures that the sound would be authentic and take that programmed feel out of the picture. There are also MIDI performance patterns provided that voice certain stylistic elements in a way the actual musician would play them. As keyboardist we are limited in how we can voice things authentically. Having this feature just makes more sense when you are hearing all of the various instruments in context, playing in their style, their range and using the appropriate voicing. The sounds themselves also capture such an interesting emotional ingredient. I think this is what has made the Miroslav series of sample libraries stand out over the years. His abilities to capture genuine performances out of these world class musicians is second to none and it shines through when you are using this instrument collection. The little inaccuracies even at times are not a drawback but an asset as it is in some of those types of things the realization of the virtual orchestra is complete. Just think about it if you tuned all of the notes of a piano to perfection and not allow for the stretch or imperfections in some of the tuning then you would be left with a sort of lifeless sound. It is capturing the naturalness of the moment that makes this library feel more human and organic rather than cold or too pristine. There are some things I noticed about the attack and dynamics of some of the instruments especially the brass that I was not too thrilled about. I wish they could have just a little more attack and that the release could be more natural and not feel cut off in some instances. This is just taking my initial listen through. I am sure things might be able to be adjusted to more my taste with some of the edit controls. If you are a current Miroslav Symphonic or Philharmonik version 1 user then this collection should be an obvious upgrade. If are just looking to find a virtual orchestra library solution you would be more than pleased with this collection as they bring together the classics sound and combine it with the new material packaged with the powerful SampleTank3 technology. You will be amazed at how the sounds will start to inspire you once you begin to work with them. The baton is on the virtual podium waiting for you. Go ahead and pick it up and let’s continue to make musical history together. Miroslav Philharmonik 2 is available now. Ordering and delivery information can be found by visiting IK Multimedia’s website.